In order to better understand the composition of rocky exoplanets, researchers have proposed a method to identify chemical signatures from surface materials. A better understanding of exoplanet surface compositions will help researchers determine the prevalence of Earth-like planets in our galaxy. Numerous rocky, Earth-like worlds have been discovered by transit surveys such as the Kepler mission. For those familiar with the transit of Venus last year, exoplanet transits are the same idea - an exoplanet crosses the face of its parent star as perceived by observers on Earth. By comparing the amount of starlight the transiting planet blocks and the total starlight emitted by the host star, astronomers can determine the radius of a transiting planet. Recent surveys have hinted at the existence of exoplanets with rocky surfaces, making them similar to our own "terrestrial" planets Mercury, Venus, Earth and Mars. However, a number of the exoplanets thought to have rocky surfaces appear to not have any significant atmospheres. One such exoplanet is Corot-7b, which orbits very close to its parent star. Exoplanet 55 Cancri e, estimated to have roughly twice Earth's radius and roughly eight times Earth's mass, also may be a rocky planet, and perhaps even made of diamond. The first rocky exoplanet discovered by the Kepler mission is Kepler-10b, with roughly four and half times Earth's mass. The Kepler mission has since discovered numerous "super-Earth" type exoplanets, which are exoplanets with masses greater than Earth but less massive than planets such as Neptune. Due in part to their high mass, super-Earth exoplanets could be rocky or have very thick gaseous atmospheres like Neptune. In order to better understand the composition of terrestrial exoplanets, researchers from MIT and Caltech have proposed a method to identify unique chemical signatures from various surface materials by studying exoplanets in the infrared portion of the electromagnetic spectrum. A better understanding of exoplanet surface compositions will help researchers determine how prevalent Earth-like planets are in our galaxy. "Looking for Earth-like planets is one of key endeavors shared by many astronomers and a broader scientific community," says lead author Renyu Hu of MIT. While the end goal would help researchers with the search for Earth-like exoplanets, the researchers methods are currently aimed at "airless" rocky worlds. By having similar objects in our solar system, notably our moon, Mars, and Mercury, the team may be able to compare detected minerals in the solar system against signatures from rocky exoplanets. The team proposes to analyze exoplanets in the infrared portion of the electromagnetic spectrum in order to determine the surface composition of exoplanets. Ideal exoplanets to study using the team's method are those that transit their host star. With current technology however, the team cautions that determining surface composition of exoplanets is a very different process than studying their solar system counterparts. Due to the limits of technology, the team proposes to concentrate on the most prominent mineral signatures detected from exoplanets. Mark Swain of NASA's Jet Propulsion Laboratory, who is not on the research team, says, "We're most likely to discover signs of life through atmospheric discoveries." Relations between the spectral type of main-sequence stars (represented by effective temperatures) and the innermost orbital distance for a rocky planet to stay unmelted. Red dots are Kepler-released planet candidates as of April 2011 (Borucki et al. 2011). From left to right, the black markers correspond to planets that have or may have rocky surfaces: 55 Cnc e, Kepler-10 b, Corot-7 b, Kepler-18 b, Kepler-20 e, Kepler-11 b, Kepler-20 f, Mercury, Kepler-22 b and Earth. Credit: Hu, et al. By focusing their method on "airless" rocky exoplanets with surface temperatures under 2,000 K, the team can analyze the unique chemical signatures of different materials. Several exoplanets detected by the Kepler mission (Kepler-22b, Kepler-20f and Kepler-11b) may in fact have silicate (rocky) surfaces, making them ideal candidates for the team's method. The team states that a large number of exoplanets detected by Kepler are the right distance from their host star to have rocky surfaces. "We propose to determine whether an exoplanet has rocky surfaces by astronomical observations, via the unique thermal emission feature of silicate rocks," says Hu. "By spectroscopy one may literally 'see' the rocks, or more precisely planetary regoliths." Different surface minerals provide unique signatures in different wavelengths. For example, in the visible and near-infrared, minerals such as pyroxene, olivine and hematite provide strong chemical signatures. Minerals such as hematite have prominent signals in the visible and ultraviolet wavelengths. Additionally, materials formed with water offer signals in the near-infrared. "Several types of surfaces that can be distinguished by observing the reflection are ultramafic surfaces (indicating active volcanism on the planet), clay surfaces (indicating past or extant liquid water), and water ice," says Hu. "Understanding the surface composition of a rocky exoplanet is one of the key steps to access the habitability and the availability of natural resources on the planet." 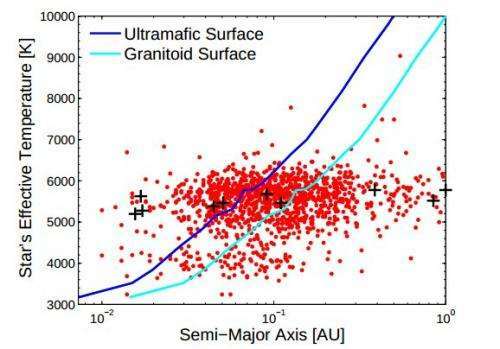 Using infrared analysis techniques, the surface compositions of rocky objects in the solar system have been studied in detail. On our moon, the basaltic nature of dark lunar regions, commonly referred to as "mare," indicate they were formed by volcanic eruptions. Conversely, lunar highlands are bright, and their composition indicates the formation from a magma ocean. Mars features strong iron signatures, which, combined with its red color, helped determine that a major component of the martian surface is a mineral known as hematite. Additional surface signatures on Mars also indicate the presence of minerals such as pyroxene and olivine. Observations of Mercury indicate similarities to the lunar highlands, however recent observations by the MESSENGER spacecraft orbiting Mercury have challenged that view due to more precise surface composition readings. 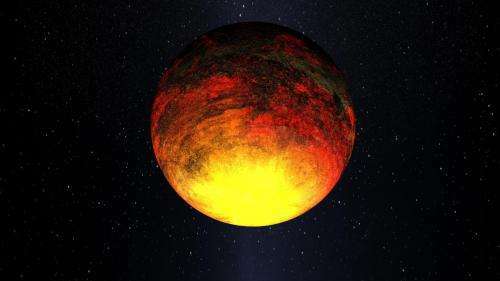 The team asserts that rocky surfaces on exoplanets exhibit unique chemical signatures, along with volcanic surfaces, and surface water ice. If an exoplanet has a thin atmosphere, it may introduce additional signatures, especially if said atmosphere contains water vapor, carbon dioxide, methane, or ammonia. The team also stresses that without prior knowledge of a planet's atmosphere, it can be difficult to determine exact surface compositions. "Once you add an atmosphere, disentangling the signals becomes more work," notes Swain. "Sorting out what's present is non-trivial, and detecting these mineralogy features in the presence of molecular features from the planet's atmosphere will be a challenge. More papers in the future will most likely explore how to separate atmospheric and surface signals." "The key to resolve this is broad wavelength coverage and sensitive measurements," adds Swain. "The team really did a good job of focusing on this." In contrast to an atmosphere's affect on determining surface composition, space weathering may alter the surface chemistry on an airless planet. Constant bombardment of a surface by cosmic rays, the solar wind, and micrometeorites can darken and redden the surface. While current space-based observatories do not possess the necessary instruments to identify exoplanet surfaces, space telescopes such as the upcoming James Webb Space Telescope are thought to have the capability to detect rocky surfaces on planets orbiting Sun-like stars. Eventually, direct imaging of exoplanets may be necessary to determine the exact surface composition. Determining the surface composition of an exoplanet will provide a better understanding of its geological history and its odds for hosting life. "In the more distant future, the detailed composition of rocky surfaces on an exoplanet can be investigated by observing the stellar light reflected by the planetary surfaces," Hu concludes. "To do this, the rocky exoplanet needs to be directly imaged, which requires space-based telescopes with great power."